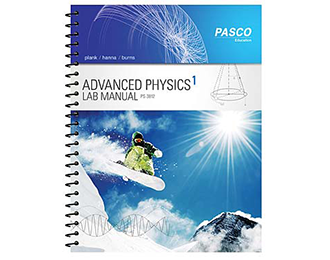 This experiment guide covers the latest standards for College Board Advanced Placement Physics 1. Every lab is based on the College Board Learning Objectives. You decide which level of inquiry is appropriate for each lab. This experiment guide also includes video support! How-to videos are included with the manual, on the PASCO web site and on YouTube, and can even be installed on your own computers. These videos focus on setting up the labs and getting the most from your PASCO sensors and equipment. There are 15 investigations in the Advanced Physics 1 Experiment Guide. 9 can be performed using the PS-3813 Equipment Kit. The remainder can be performed by adding the PS-3814 Expansion Kit. *IB is a registered trademark of the International Baccalaureate Organization, which was not involved in the production of, and does not endorse, this product. **AP is a trademark registered and/or owned by the College Board, which was not involved in the production of, and does not endorse, this product.